Check out this dramatic make-over designed & created by Vicente Wolf for Harrice Miller, a dealer in and historian of costume jewelry, and a producer of Indian classical music concerts. The NY Times asked Mr.Wolf, who's know for his sophisticated and neutral interiors, to redecorate the second bedroom that was being used as storage and transform it into a guest room. Needless to say, he went way outside the box with this project, centering the color scheme around Benjamin Moore Hot Lips paint, and keeping with the "theme" of an Indian Sanctuary. 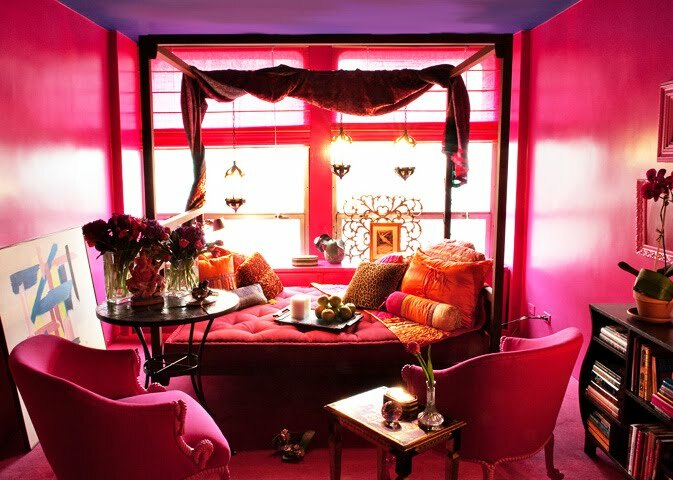 By carpeting the room in a color similar to the walls, he created a cozy, almost cocoon-like feeling. 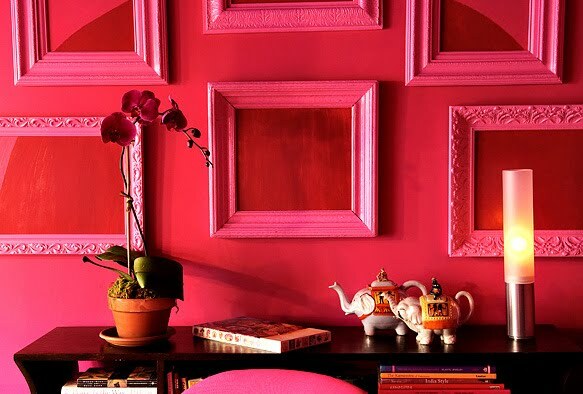 Now as a guest, I think it would be fun to stay in this room - a dose of color like this can go a long way! What do you think about this make-over? Love it? Hate it? Wow! That's seriously pink! Fabulous! ADORE this room and the feel of it, couldn't have something like it in my house tho, I think the pink would get too over-powering after a while! Wow, that is a huge transformation - I wasn't expecting that! The color is bold but I really like it! Also like the plain frames on the wall, very cute idea. Oh, wow! This brightened my day so much! Thanks, Jules! I like the before pictures better. There is no respite from the harsh color. Very hard on the eyes! cute, in theory. and the carpet? god, i thought we were over carpeted floors! 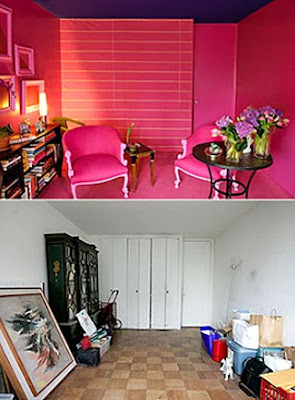 Even though I think it is an amazing transformation (and what woman doesn't love pink?!) I actually love the bones of the space and potential of the room in the BEFORE photo, along with the furniture she had laying around to begin with, more than what they have going on now. I think this room is "picture perfect" I just think it is too loud for me personally. I tend to like loud color in small doses around the home, otherwise it becomes so overstated to the point that you can barely appriciate it. 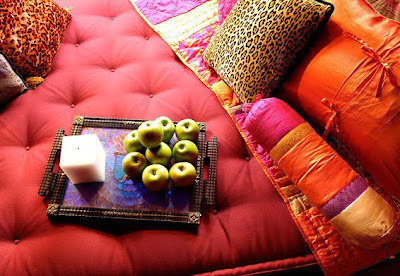 But again, it is not a bedroom so maybe it is just that one crazy fun space in her home she likes to retreat to. To each his own, righ? Wow! 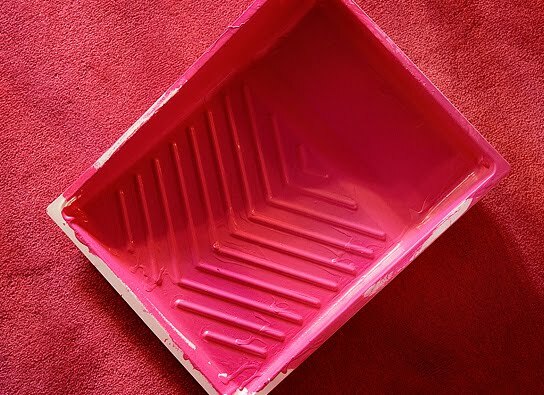 You totally notice the windows so much more against that pink! Great redo! This is so not Vincente!! I was speaking to a friend of his a couple of days ago about this make over....I think I would enjoy spending a week end in the "Indian" decors but would quickly go out of my mind. My hat to Vincente though...i think he did quite well. wow, deliciously scandalous! certainly not for the faint of heart, luckily I'm not! What a great choice of hue/colour harmony. It's amazing the warmth emanating from the room compared to the previous cold and dare I say sterile, shot. wow. a bit too pink for me but its really cute! 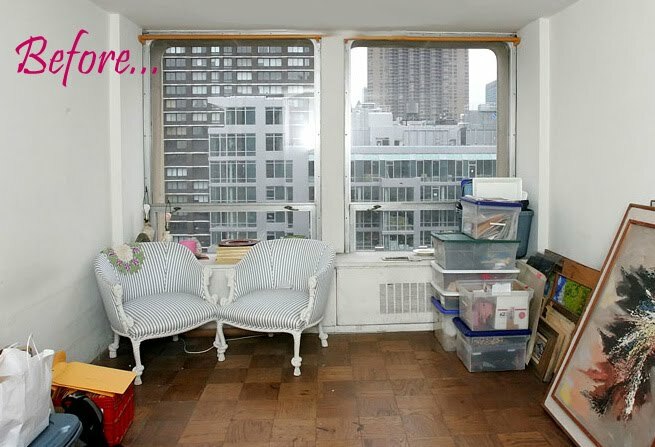 I do love the chairs in he before photo though! i'm enjoying reading all of your diverse opinions on this space! most are either loving or hating it and when it comes to design or art, it's better to have someone feel strongly about your work (good or bad) - that means you've made a statement. much better than people feeling indifferent, don't you think? Oh my goodness, wow! That is gorgeous! I love pink so this would be my ideal room hah. I'd love to decorate that room with mirrored furniture , that would look stunning. 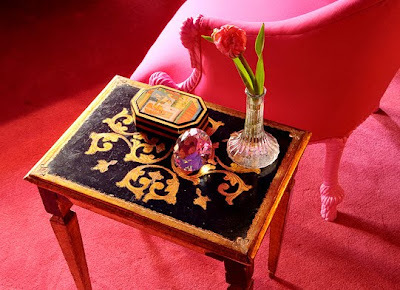 Or actually perhaps silver furniture would look better against the pink? I may have to do the same now, I'm inspired!! 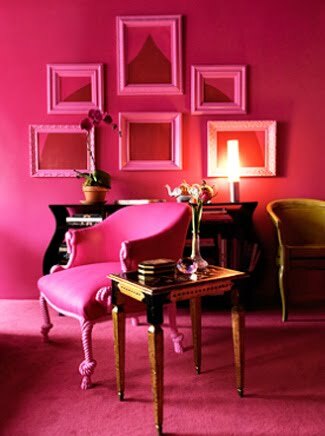 Hmm, a pink room and huge pink decorative mirrors to finish :) Thanks for sharing, just beautiful.